We use the Athame to Cast the Magick Circle, to open the Magick Circle, to Carve Pentagrams in the air, in High Magick Rituals and to ring our Bells when calling the Watchtowers. The Bell is a feminine symbol of the creative force, the Great Goddess and is often used to invoke the Goddess during ritual. The Bell is also used at the Four Quarters to call forth the Elemental spirits or the Ancient Watchers. In Ritual the Bell is used as tool of invocation to welcome the Goddess, or to banish negativity; the clear high pitched sound drives away all evil spirits. The sound of a sacred Bell purifies all vibrations near it - a room, a person, an emotion etc. Placed within a cupboard or hung on the door, the Bell guards the home. At the end of a ritual the Bell can be used to clear and disperse energy. A witches Besom is traditionally made with an ash handle and birch twigs that are tied on with pieces of willow wood. The ash stick provides magickal protection and the birch twigs are meant to entangle malicious spirits. Willow twigs may be substituted, as they belong to the sacred tree of Hecate. As a ritual tool it is both masculine and feminine, the handle masculine in nature and the birch bristles feminine. The handle is plunged into and attached to the bristles, a perfect union of male and female energies. The broom represents the Element of Air. The fantasy images of witches riding about on broomsticks are based on actual fact. Pagan Western European fertility rites involved women straddling the broom and riding it like a horse, around the fields to encourage crops. Brooms have always been a symbol of women's domesticity. A woman would push her broom up the chimney or prop it outside the door to indicate that she was out of the house. The broom, a tool kept in all households and used by all women became a tool and symbol of witchcraft. It was an easy leap to believe that witches could hop on their broom and fly up the chimney! It has been said that Witches Flying Oil, a concoction made from aconite, belladonna, hemlock and henbane was rubbed on the handle of the broomstick before being "ridden" to Sabbats or Moon rituals. This would deliver the drugs topically. The powerful hallucinogenic ingredients combined with ecstatic chanting and dancing could very well cause the drug- induced hallucination of soaring through the air. Today the besom's fertility magick symbolism is evident during the Wiccan handfasting custom of "jumping the broom". The besom was considered an attribute of Hecate in ancient Greece. In modern Wicca the besom is a symbol of witchcraft and a reminder of times not so long past when we were persecuted for our beliefs. It is used to cleanse and purify sacred space by sweeping away baneful energy. Single use ritual brooms can be loosely put together, then burned or taken apart following use. Special magickal brooms that are only used during rituals. Plain household brooms can be used to magickally cleanse and purify your home. Some traditions of Wicca say that your besom must never touch the floor and must only be used as a ritual tool. Others traditions hold that the power of your besom can be used for all manner or magickal and mundane work. Not everyone has the means to possess an array of tools reserved specifically for ritual use. Mundane activities, such as sweeping your kitchen floor, can be magickal with the correct intentions. The boline is traditionally a white-handled ritual knife with a crescent shaped blade used for physical cutting of cords, herbs, carving candles etc. One should never use one’s Athame to physically cut anything except the Magick Circle. The Book of Shadows is a powerful tool of the Witch, containing magick spells, rituals, recipes, and experiences. Traditionally the Book of Shadows is written by hand over a period of years and is very useful as a record of how your spells were cast, what ingredients you used, time of day, phase of moon, etc. so that successful spells and rituals can be repeated. The Chalice represents the Element of Water and the power of the Mother Goddess. It is the second of the four major sacred tools. A Chalice can be any kind of cup or glass and is used to make libations or drink offerings and to confer blessings. An Altar Chalice is filled with wine (or water or juice) which is blessed and consecrated during the Ritual. 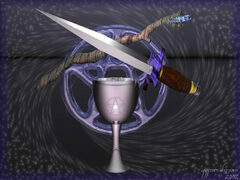 Part of a Blessing Ritual may involve placing the Athame into the Chalice. This act is called the ``Great Rite``. The Athame represents the phallus of the God, the Chalice the womb of the Goddess, when the Athame enters the Chalice it is the union of Goddess and God. This is a very important aspect of Wiccan Ritual. A sip of the consecrated liquid is then offered to each person in turn who symbolically drinks the blessing. A Cauldron symbolizes femininity and fertility, rebirth and transformation, the Western Quarter and the Element of Water. When used during Ritual on the Altar the Cauldron can be used to hold a candle, or to burn loose incense or magickally empowered herbs on a charcoal disc. It is also a great heat-proof container to use when burning paper containing written petitions, prayers or spells. You can also create "Witches Brews" which are magick spells in liquid form within your Cauldron. Here's a link to a typical Witches Brew. Witches Brews should not be made in a cast iron Cauldron because it will cause your "brew" to darken, instead choose a ceramic or copper Cauldron for your brews. Black Salt, a powerful banishing potion can be made within your Cauldron (follow this link for my personal recipe). A black cast iron Cauldron makes a great scrying tool, simply add water and gaze within. One of the most important tools to the Witch as an herbalist is the mortar and pestle. It is the hands on tool of magick where materials are prepared, refined, mixed and diluted. The mortar and pestle represents the witches’ ability to stir up magick and send it forth. The mortar represents the womb of nature, collecting, creating and regenerating. It is the birthing womb of herbal magick. The pestle represents the phallus through which energy is directed. The pestle fertilizes and initiates the forces of manifestation and directs the magickal forces into the mortar. Mortars and Pestles may be made of wood, stone, metal or ceramic. A wooden mortar will absorb chemicals from plants more readily than metal and will need to be cleaned thoroughly after each use. Stirring the pestle in the mortar clockwise builds energy, stirring the pestle in the mortar counter-clockwise disperses energy. The Pentacle represents the Element of Earth and is the fourth major sacred tool. The Pentacle is the symbol of Witchcraft and is over 8,000 years old. It is the most powerful and popular symbol used by Wicca’s and pagans. Its message is that we have the ability to bring Spirit down to Earth. What exactly does that mean? To me it means that we can channel Divine energy into our bodies and use it to our purposes. Nearly all cultures had a 5 fold spiritual or religious symbol. Around 500 BCE, Pythagoras set up a mystery school to teach divine knowledge. Unfortunately the school was brutally repressed and his followers and their knowledge were forced underground. Because Pythagoras considered the five-pointed star to be a symbol of life and of the divine human, it became the secret sign of the Pythagorean followers. From the Pythagorean schools descended the Gnostic and Hermetic Mystery Schools, Masonic Guilds, alchemists, scientists, philosophers and magicians, all of whom kept the five-fold symbol and its positive attributes of hidden knowledge. Because the star of life symbolized divine illumination, it became a sign of heretical thought because it threatened the power of the Christian Church. The Pentagram was transformed into something evil, and even became a symbol of the Christian Satan’s followers. Today, for us the Pentacle contains many layers of symbolism. The Five points represent the four directions with the fifth uppermost point representing Spirit. The Circle around the pentagram represents, unity, the wheel of the year and wholeness. The Circle, a single unbroken line, is used to create magickal space in Ritual. A Pentacle Disc is placed in the center of the Altar and is used during ritual to consecrate objects by laying them upon it. Any tool, herb, amulet, jewelry or crystal will have increased metaphysical energy after being placed on a Pentacle for a time. In our tradition the Stang represents the Horned God in his aspect of protector, destroyer and life giver. The Wand represents the Element of Fire and is used to direct energy. It is the third of the four major sacred tools. To use a Wand hold it in your power hand and focus energy through it, visualizing the energy emerging as a beam from the tip of the Wand. Certain wands can also be used to `capture` energy. To capture energy with a Wand, point it at the object that contains the energy you want to get then visualize the energy pouring into the Wand. You’ll feel it entering your Wand as a tingle, pulse or warmth in your hand. Magick wands work through the power of the practitioner. It directs the users will and intention. Traditional wands are made of wood, but metal wands can be very effective also. You may purchase a wand, receive it as a gift or you may inherit it from another practitioner. You may also create your wand from natural wood, stone, crystals or metal. Your new wand must be cleansed of all previous influences and then charged with your own personal energy. The exception is if you inherit a wand from a magickally powerful person. In this case you will want to maintain the vibrations and build upon them with your own energy. Your magick wand should be stored with a charged quartz crystal, and wrapped in red silk. The traditional length of a wand is 18" or the length from your elbow to the tip of your forefinger. Wood wands are powerful tools to use to call upon the power of trees and to communicate with nature spirits. In some traditions it is forbidden to cut a wand from a living tree, in others it's perfectly acceptable as long as the tree is consulted and offerings are provided. If you don't want to cut from a living tree you may look for branches on the ground or ones that are broken off but still hanging in the tree. These wands are considered "gifts" from the tree and offer great power. If you want a wand from a specific tree you may request that the tree drop a branch, then return periodically to see if your wish has been granted. The best wands come from trees with which you've formed an alliance. To form a relationship with a tree, visit it often, talk to it, listen to it, and bring it offerings. When you feel you have a real alliance with the tree, request a branch or wait until one is given to you. Once you have your wand, be sure to keep visiting the tree and it will continue to enhance the power of your wand. You may re-energize the wand by laying it against the trunk of the mother tree. If you do cut a branch from a living tree, be sure to consult the tree spirit and ask it's permission. Sit beside or under the tree sure to take the time to listen to any answers that may be given to you. Explain to the tree why you wish to take a branch. You may also request a sign, such as the rustling of leaves or the sighting of a bird, or a sudden breeze. After receiving permission from the tree, be sure to cut the branch as swiftly and painlessly as possible. Once you have cut the branch, offer the tree a libation of water and an offering such as a quartz crystal, stone, herb or whatever you feel is appropriate. You may decorate your new wand by placing a quartz crystal at the tip, carving runes or other magickal symbols and embellishing it with stones, feathers, metal, leather etc. Hawthorn - Hawthorne is protected by Faeries, never cut a wand from a Hawthorne tree, or there will be dire consequences Use only fallen or hanging branches. Quartz Crystal Tips -Add power to any wand. Rose Quartz - Attached to any wand aids in love spells.